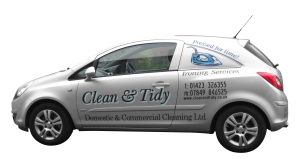 Clean And Tidy provides a flexible domestic cleaning service which is tailored to suit any individual requirement. Please contact us and we can provide a no-obligation domestic cleaning quote. We provide trained and motivated staff who provide a superb service that will exceed your home cleaning requirements. All staff work in pairs and are fully uniformed, responsible, trustworthy and considerate of our customers and their homes. Our Services can be on a daily, weekly, monthly or one-off and occasional basis for spring cleaning. Frequency, type and length of service required can be discussed and agreed before commencing. We also provide additional services to meet other households needs, such as ironing. Our additional services can be booked as one-offs or annually, alongside our cleaning services or stand-alone. All of our professional services are available any time you need. We understand you need the cleaners for time that suits you best, which is why we have made sure your wish is our command and the cleaning session can fit perfectly into your own schedule.